As more and more industries and businesses have come to accept social media as an essential part of their day-to-day marketing operations, the focus has turned to how social can be scaled throughout all facets of business. From sales to human resources, social media tools are proving to be valuable assets for improving efficiency and effectiveness across the board. With this new focus on the ‘social business,’ discussions have frequently turned to the C-suite and how an executive’s presence on social networks can benefit business. While this is an important discussion to have, much of the talk has focused on tech CEOs whose companies often provide services directly related to social media in one way or another. Richard Branson is undeniably a leader in the social space, and not only among CEOs. Branson has committed to blogging and contributing content that enriches the experience of his followers and of Virgin’s clients. With over 3.3 million Twitter followers, over 4.7 million Google+ followers, and 2.1 million followers on his LinkedIn influencer blog, Branson has no equal among social CEOs. Unlike many of his counterparts, he also follows several thousand people, and tweets often about a variety of topics (not only business). This engagement truly sets him apart and strengthens his presence online. So how does Branson’s social media use help drive business results? Richard Branson is his own brand: people see him taking part in extreme sports, flying across the world and managing a business empire, and they want to follow that activity much like they would a celebrity. He shares that life through social media and followers join him on his journey, all the while being exposed to Virgin and its products and services. In this way Branson’s social media activity acts like cross-promotion: the Branson brand and the Virgin brand boost the profile of one another. 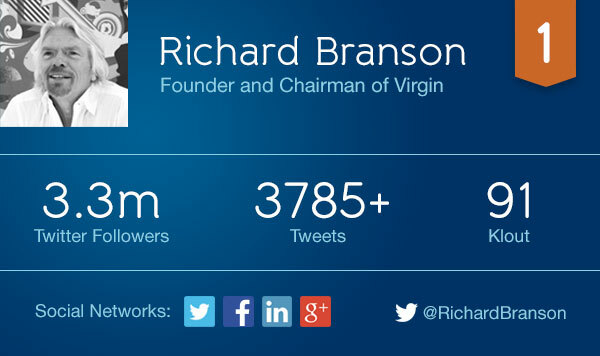 Branson’s activity on social also helps engrain a culture of social media throughout Virgin. He tackled the subject of why executives should use social media in a LinkedIn Post, writing “[…] Like all other areas of business, CEOs have the opportunity to set the bar. By ignoring social networks, they are potentially missing a trick.” Branson clearly leads the way. With over 260,000 followers on his LinkedIn Influencer blog (more than double his very impressive 111,000-strong Twitter following! ), Caan has become one of the most prominent business leaders on that channel. He has also dedicated much of his activity on social media to business advice, articles and posts that provide real value to entrepreneurs and companies. In addition, Caan is using all aspects of social media, even the background image of his Twitter profile which currently advertises a free audio book. 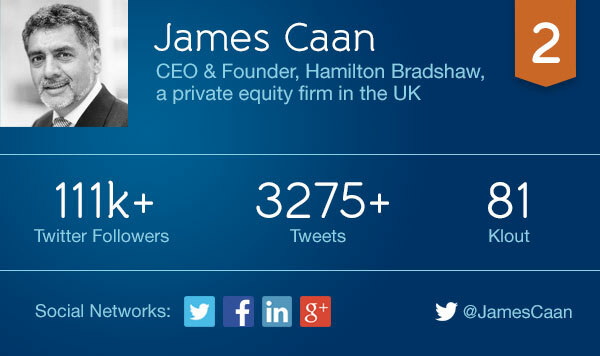 So how does Caan’s social media activity help drive business results? Caan is in the unique position of working at an equity firm, meaning his company’s success is directly related to the success of companies that they fund. Caan draws attention to these companies using social media. He tweets about successes, business updates, and even job opportunities at the various companies, significantly boosting their reach and public profile. Of course, these tweets are interspersed with blog posts with business advice and retweets of other business leaders in order to appeal to a wide audience online. Caan shares his wealth of knowledge with his social media following, and people trust him. That trust can mean a lot when he channels people to the businesses supported by Hamilton Bradshaw. 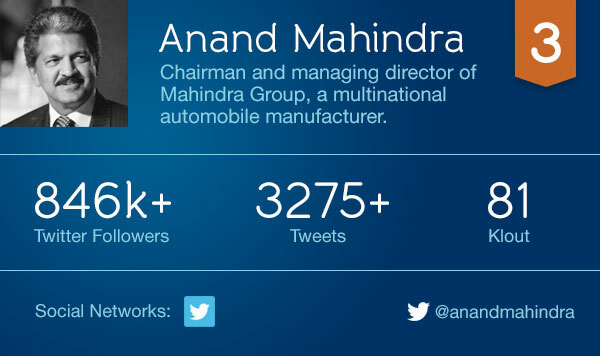 With over 844,000 Twitter followers, Anand Mahindra is undoubtedly influential in the social space. Mahindra’s Twitter feed is an engaging mix of business and pleasure, and of broadcasting and engagement. Yes, he posts about his company, but he also posts inspirational quotes, he posts about cinema, and he even posts about about American politics. He shares his thoughts and passions, and retweets and shares the messages of those who engage with him on those topics. Mahindra is a great example for executives to follow as he is one of the rare CEOs that publicly shows his true colors. Followers love him for it. So how does Mahindra’s social media activity help drive business results? Mahindra is an Indian company that isn’t necessarily a household name in North America or even Western Europe. With each post, Mahindra is working to change that. He puts out content that is valuable or entertaining to people anywhere in the globe, and in doing so he has attracted a global audience. Those loyal followers are exposed to the Mahindra brand and business along with all the rest of the content, helping to boost the company’s international presence. Being personable helps Mahindra himself, as well as his business, have global appeal. Conant seems to have Twitter pegged: he posts Instagram photos, he thanks the people that retweet him, and he even does occasional Follow Friday (#FF) lists. 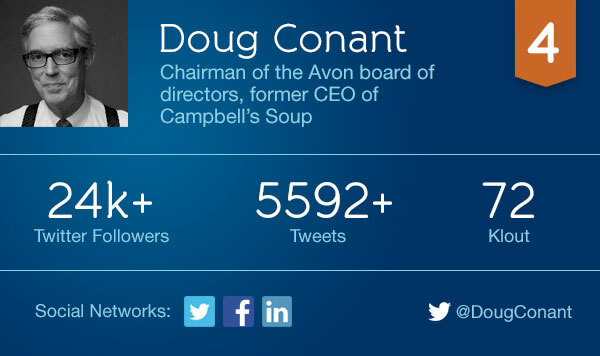 While his follower to following ratio is far less impressive than many executives (24,500 vs 18,500), Conant engages his followers and tweets a lot (often ten times a day!). And his social presence isn’t limited to Twitter. Conant maintains his LinkedIn profile, Facebook profile and has written blogs for the Harvard Business Review since 2011. He also doesn’t shy away from being personal. While he is no longer with Campbell’s Soup, Conant is one of the few people who has sat at the head of a Fortune 500 company that you would actually believe tweets for themselves. So how does Conan’s social media activity help drive business results? Basically, Conant recognizes that social media is essential for the modern day executive. You can bet that his commitment to social media is passed on to executives and all employees through his role on the Avon board of directors. Conant is so dedicated to social media use in business that he will become the head of Northwestern University’s Kellogg Executive Leadership Institute next fall. While there he’ll be directly involved in preparing C-suite executives for new challenges like workforce diversity, corporate governance and (you guessed it) social media. Conant’s contributions actually go beyond his own companies. He is working to increase the social savvy of executives across the country, and we’re better of for it. Peter Aceto is a regular presence on Twitter and Google+, and with over 8,000 tweets to his name is one of the most dedicated social posters. While he has the smallest following on this list, his dedication to engaging and educating his followers is commendable. Aceto writes a blog called “Direct Talk” for the company on which he discusses everything from finance and customer engagement to the culture and working process within the company. His personality and approach also earned him a funny spot guest starring on a Daily Show segment contrasting Canadian and American bankers (in which he comes out well ahead). 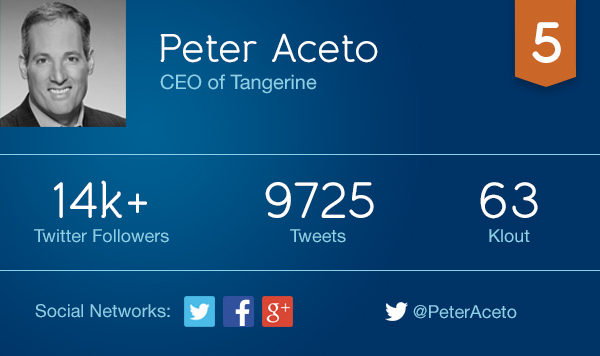 So how does Aceto’s social media activity help drive business results? Well, Tangerine doesn’t have any physical branches, relying instead on phone and internet communications with its customers. By being active on social, Aceto adds a face to this communication (he has literally added his own face by using video in some blog posts). He shows that, despite the lack of branches, the company is not lacking in real people willing to deal and interact with clients (even the CEO is getting in on customer service). Having personally interacted with customers on social media, Aceto has also used the information gathered in these conversations to modify and hone the company’s business model. In short, Aceto is a social CEO that helps customers and uses their online feedback, creating loyalty among his followers. 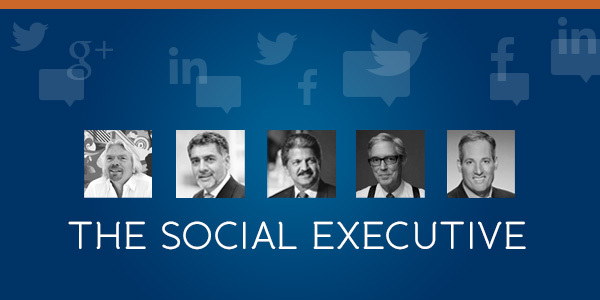 So did we miss any CEOs that are doing great things on social media? Let us know in the comments.